Vada Curry, also called as Vadakari or Masala vada curry is one of the most popular and humble South Indian side dish / gravy/ curry for Idli, dosa, set dosa, poori, chapathi etc. This is one of the versatile side dish usually made in restaurants and small street corner tiffin centres in Tamil nadu. Though this side dish is usually prepared with the left over masala vadas in restaurants, i admit that at my home, there will never be any left over vada’s as my sister and i gobble up the masala vadas as soon as my mom prepares it. So at my home, vada curry is always prepared with the freshly made vada’s. So i got this recipe from my mom and prepared it. It is a sure winner and i relished it with dosa. Though making vada curry is slightly time consuming, as you are preparing vada’s and then you have to prepare the gravy/ curry for the vada’s. But i must tell you, it is worth the time as the vada curry is a tasty, spicy side dish for idli, dosa and even with poori and rotis. Soak the chana dal for 2 hrs. Drain the water and grind it along with red chillies and fennel seeds to a coarse paste without adding water. Add required salt and mix well. Form small patties of vada’s and keep aside. Then in heavy bottomed kadai, heat oil and deep fry the vada’s till golden brown. Once done, remove it and place in a paper towel to absorb excess oil if any. The vada’s need not be too crispy as we are about to add it to the gravy. Now the vada is ready. Set aside to cool and later crumble into small pieces. Boil tomatoes with water until the skin starts to split. Peel off the skin and puree it. Keep aside. In a kadai, heat oil and add cinnamon, cloves, bayleaf, green chillies and curry leaves. Saute for about a minute. And the seasoning is done. Then add the ginger garlic paste, saute till it is slightly browned. Then add the prepared tomato puree along with required salt, turmeric powder, coriander powder and red chilli powders. Fry for few minutes till the masala blends well. Then add 3/4 cup of water and allow it to boil for about 10 to 15 minutes in medium flame. Finally, crumble the prepared vada’s and add it to the curry and allow it absorb the gravy well. Simmer for 15 mins. Let it become soft. Give a stir and then garnish with coriander leaves and switch off the stove. Serve the Vada curry with idli, dosa, roti, or poori. Alternatively you can make small balls of the vada batter and steam the vada’s instead of deep frying. This side dish is a sure table winner along with idli or set dosa. Whenever i prepare this side dish, i remember my dad as he loves eating this side dish along with dosa. It is such a versatile, spicy and tasty side dish for sure! Previous Post Many more Awards… And a note of Thanks to all! Now to make some masala vada and try this curry! 🙂 We make similar use of leftover Pesarattu to make kurma! Do try out, you will like it! I love Pesarattu. Its such a comfort food. Using left over Pesarattu to make kurma sounds delicious to me!! Yes dear, even i love the Vadacurry with dosa combination. Simply delicious 🙂 Do try out for yourself at home! Yum! I would love to have a bowl of this curry right now 🙂 Thanks for sharing the recipe! Hi Aishwarya, I am new to your blog, just found it when I was hopping around. 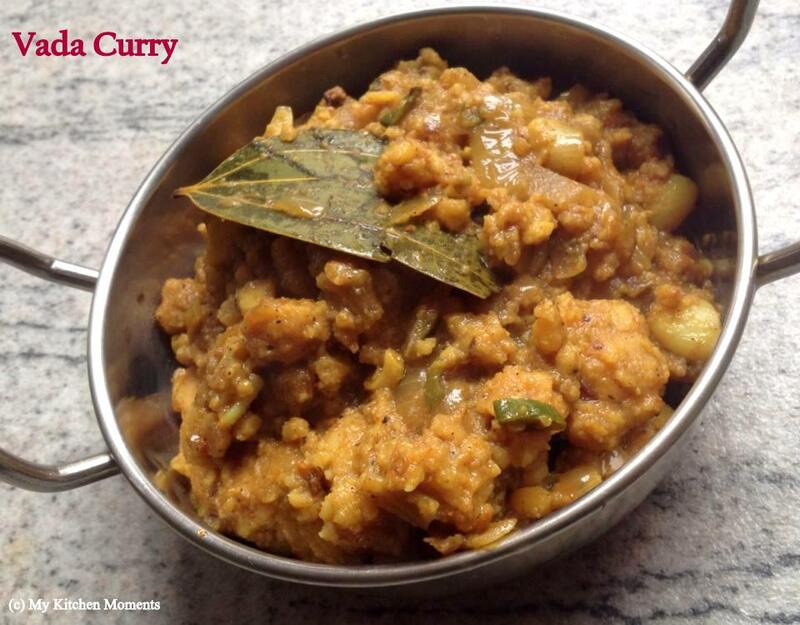 This vadacurry looks so tempting. I am a big lover of Vadacurry, seems I should try it soon. Vadacurry…I have heard people singing its praise…never tried it though! Hope you could pass some for me to taste! Sure dear 🙂 Right away! Looks interesting and must be tasty! 🙂 never tried such dish! Thank you dear Mila! Do try if you get time, you may like it….